A charming little romance: This is a great little story for those people that want to not think about anything just be entertained with something that's a little funny a little romantic and easy going for the eyes and ears. Vanessa Redgrave is a delight In this film but the real star is the Tuscan scenery. Good Movie, wished it played all the way through. Wonderfully relaxing movie - enjoyed! Originally rented this movie and later purchased our own copy. Thought it would be your average "chic flick", but my husband also enjoyed it very much - real treat to see Vanessa Redgrave in the role she portrayed, and Amanda Seyfried was excellent in this movie after first seeing her in "Mama Mia"! Photography was superbe - all in all, a very relaxing movie! Watching Vanessa Redgrave and her real life husband, Franco Nero, back together in a film as lovers again proves to be well worth the 40+ year wait! The last times I remember them together both were so young and totally beautiful. I can't recall which movie was the latter of the two: "Camelot" or "A Quiet Month in the Country"? The plot is about a young woman (Amanda Seyfried) going with her lover to Verona, Italy. While there she becomes involved with a group of women who answer letters written and posted on a wall to Shakespeare's Juliet. 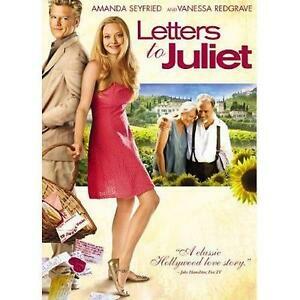 In the process, she finds a 50 year old letter and it inspires her to become one of the Juliet letter writers. The letter was written by Claire, Vanessa Redgrave's character, to Leonardo, Franco Nero's character. After Claire receives the Juliet response to her 50 year old letter in NYC, she goes on a quest in Italy to find Leonardo. Talk about a movie that aptly deals with the truest meanings of love and romance and this is it. I think this movie will reach the ranks of a romantic classic over time. Redgrave's performance is absolutely essential to the film's success. Nero's performance with her comes very late into the movie. It's well worth waiting for. I've waited nearly 50 years to see their romantic chemistry performed on screen again. I'll treasure every second.